A Fuller's pub on the Hogarth roundabout in Chiswick, a stone's throw from the Griffin Brewery - the closest pub other than the brewery tap. 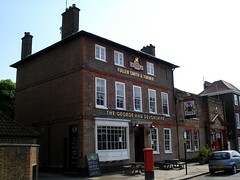 It claims to be the oldest pub in Chiswick, and also the only example with an old-style public bar separate from the saloon bar. RGLers have noted that the left hand bar (not sure which one this is? --Kake) doesn't seem to be open very often. It's in the Good Beer Guide. The beer is predictably good, and the three main Fuller's ales (Chiswick, London Pride, and ESB) seem to always be on. They also have regular guest beers from non-Fuller's breweries (e.g. Brakspear Bitter in January 2007). The food situation here seems to be quite changeable. Although they were definitely doing evening food at the beginning of 2007, by November 2007 this was no longer the case, but signs spotted by bob in October 2008 suggested that evening food was back on again. Bob has visited several times, both alone and in the company of others. On a lunchtime visit in October 2008 visit, a pint of lemonade and lime was £2.35 and an all-day breakfast photo was £5. Lunch is served noon-3pm. An anonymous visitor informed us in May 2007 that they have a function room for social events with a solid wood floor for dancing, a secluded garden area, and a custom-built outdoor smoking area; and that they hold "regular music nights" (it isn't clear what this actually means) and have space available for art exhibitions. Last visited by bob, 17 October 2008. Lunch times established on that visit. Last edited 2013-05-10 07:13:36 (version 28; diff). List all versions. Page last edited 2013-05-10 07:13:36 (version 28).